If your business would benefit from an online system which allows you to control where and when business calls are answered then look no further. We have developed an intelligent Call Routing solution that enables you to capture all of your calls from anywhere, on any device, 24/7. Users can control call destinations based on the time of day and capture unanswered calls in real-time. Call divert incoming calls to multiple mobiles or landline phone and control the number of rings before stepping to the 2nd or 3rd target. And don't worry if you’re not an IT expert, our support team can assist with call forwarding, as well as provide you with a direct line for ongoing support. Call forwarding is available to non-geographic or virtual business numbers with Telecoms World. Learn more about our Inbound Numbers. Using the Call Routing solution, configure your business open hours to start at 9:00 through to 17:00. This will set the system to recognise that calls made to your business number will arrive to your target number (landline or mobile number) during your operational business hours. Based on these settings made for for your 'in-hours' then choose where you would like calls divert calls to 'outside of working hours' i.e. from 12:00 midnight to 8:59 and also 17:01 through to 23:59. If your calls are not set to be answered outside of working hours then the voicemail to email is instantly activated meaning that calls are captured and opportunities are not missed. Simply open our Call Manager to access the time schedule and set business open hours. 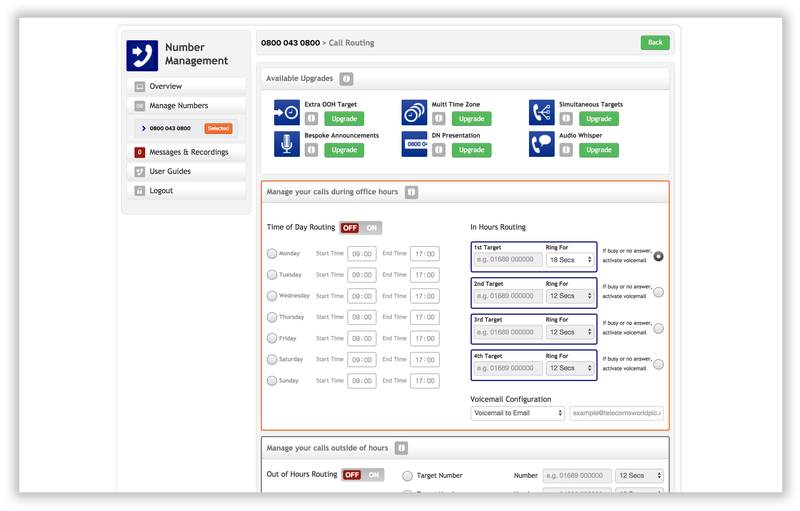 Calls in-hours can be configured to target any UK landline number (01/02) or UK mobile (07). At the click of a button your changes are saved and active. Calls that are received outside of business working hours can also be captured by phone or voicemail. Ensure that you can identify the business call when answering calls outside of business hours from a mobile or home phone using the Call Whisper or DN Presentation upgrades.